It’s been an entire nine days since the season ended for 1. FC Köln, so, clearly, it’s time to get rolling on some friendly matches! Wednesday night, the 1. 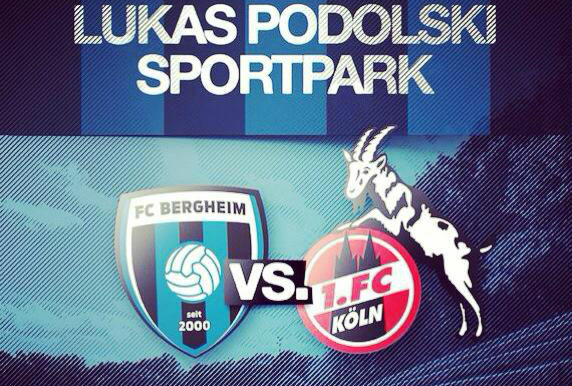 FC Köln will visit Lukas-Podolski-Sportpark in Bergheim for the first of three friendly matches in three days before everyone heads off for various summer activities. “Lukas Podolski Sportpark”?! What a crazy coincidence, right? I mean, Lukas Podolski is also the name of one of the club’s favorite sons and current FC Arsenal and German national team player. What are the odds?! They named their stadium after the same Lukas Podolski? While I’m certain there are more than a few children, pets, cars, and other various items around Köln named after one of the club’s most-beloved figures, FC Bergheim 2000 did not decide to dedicate their stadium to the blue-eyed idol with the dangerous left foot out of super-fan devotion, nor even because Podolski spent some formative years with the club (well, with one of the clubs – FC 07 Bergheim – that was part of a merger creating the current club) before moving to the bigger club to which he’s famously attached as member, fan, and sometimes player. No. The reason for Poldi to have the stadium named in his honor is that he donated 160,000 euro so the club could install artificial turf there. For an athlete, Podolski often comes off as a very likable sort. As sports fans, little appeals to us about an athlete than when they are capable of the same childlike devotion to a team, and nobody would ever question where Poldi’s heart lies. Actually, that’s not true. I’ve seen Arsenal fans fawning over things Poldi has said or written on any of his many social-media outlets, expressing they love how much he loves Arsenal. I may have even been inspired to bring them crashing back down to earth by telling them how quickly he’d drop their beloved English side for the Effzeh were surrounding circumstances there similar (fiscal, competition-level, etc.). They can be fooled into thinking otherwise, but the billy goat’s share of Podolski’s legendary loyalty will forever remain in Köln. Yet, it’s this expression of love for his prior club that is so impressive here. Without question, athletes often find plenty of charitable ways to spend some money, but when was the last time you heard of a currently active athlete getting a stadium named for him? Even when it’s former players getting dedications, it’s usually for their athletic feats, rather than charitable contributions. And now Podolski’s heart and soul will visit the club of his youth to play a match in the stadium of his name. While I have no real love for friendly matches, this is the sort of event that reminds of all the little things you miss by being so far away from your club. While the match itself cannot be of too much interest other than it being some football on what should be a gorgeous night in an appealing setting for the football romantic. There will be autographs afterwards, during which I would try to limit my son from talking the ears off his favorite players (currently Timo and Ujah), assuming he didn’t fall asleep before the end, as it would be past his bedtime. Plus, the price is right. Ten euro for adults? Five for the young ‘uns? How’s the currywurst in Bergheim? I don’t even know what level of football our host club plays. I went to their official website in search of some basic information and learned mostly that whatever resources were leftover from the playing-surface upgrade, not enough went to their public relations/marketing teams, as the league table on the site is stuck on match day 14 results. The site doesn’t even have a fixture list for their top team, instead sending you to a different website to get that information! Now, that’s not really charming, rather a bit annoying. But I can forgive it for a club with a stadium named after Lukas Podolski and maybe a decent currywurst paired with a tall mug of beer. Let’s get together on that, shall we Bergheim? Be the first to comment on "Lukas Podolski Park? What better locale for a friendly?"